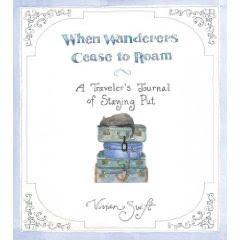 "When Wanderers Cease to Roam" by Vivian Swift is a very quick read. It is a light-hearted and fun look into Ms. Swift's life on the Long Island Sound for the past decade as well as her travels from not-so-long ago. We get to see Ms. Swift's diary, literally, throughout this book. The illustrations in the book are very whimsical. The fact that the entire text is hand-written adds a very nice, personal touch. I felt at times that the book was a bit thrown together with everything not really logically fitting where it was placed. I do realize that this was part of the author's intention. However, I feel as if there was too much of this making the book seem "messy" at times. I think some will find this book a bit too loose while others will find the style suits them just fine. This seems to be a book that one will either love for it's free-spiritedness, or find too boring and loose. I would like to see an exerpt from the book placed online to help one decide if the style of the book will be for them. While this will turn away some potential buyers, it will lure others in just the same.